Search engine giant Google has agreed to buy web advertising network Doubleclick in a $3.1bn (£1.6bn) deal. The cash buyout, the biggest in Google's history, will allow the company to tighten its grip on the advertising market. Doubleclick helps link up advertising agencies, marketers and web site publishers hoping to put ads online. In recent years, Google has been expanding into print, radio, video, mobile and TV ad markets. 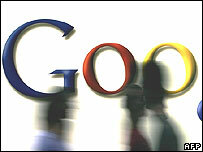 News of the deal comes just six months after Google paid $1.65bn for video sharing website YouTube. "It has been our vision to make internet advertising better - less intrusive, more effective, and more useful," said Google co-founder and president Sergey Brin. "Together with Doubleclick, Google will make the internet more efficient for end users, advertisers, and publishers." According to reports, Google was not the only company hoping to take over Doubleclick. Microsoft, Yahoo and Time Warner were all said to be considering bids for the firm. New York-based Doubleclick has been majority-owned by private equity firm Hellman & Friedman since 2005, when the group paid $1.1bn for its stake. JMI Management is a co-investor in the company, which has more than 1,500 corporate clients. The boards of both companies have approved the takeover, which is expected to be completed by the end of the year.